Age Not exceeding 35 years as on normal closing date. Relaxable for regularly appointed Central /UT Govt. servants upto five years as per the instruction issued by the Govt. of India from time to time. A. 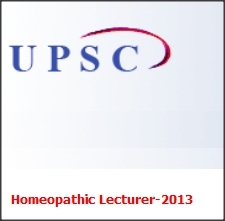 Post Graduate qualification in Homeopathy or Degree in Homeopathy with four years of professional experience. The qualification shall be the one included in Second Schedule of Homeopathy Central Council Act, 1973. Duty(ies) -To undertake teaching, conduct practical and clinical which include preparation of the lessons, assessment and evaluation. - To supervise the functioning and undertaking developing activities of the department. - To conduct periodic examination, tutorials , organizing group discussions, seminars, symposia, quizzes etc. - To perform patient care duties in OPD and IPD attached with the institution. - To carry out the administrative and research work of the institution. - To assist Assistant Professor in the overall development of the department. - The Principal/Directorate may assign any duty from time to time. Other Details Delhi Health Service (Teaching cadre of Homeopathy) Central Civil Service, Group ‘A’ Gazetted, Non-Ministerial, The posts are permanent. Persons appointed to the service shall not be allowed private practice of any kind whatsoever including any consultation and laboratory work.